The Lexmark C925de allows busy workgroups to increase their productivity without compromising printing costs and quality of the printouts. It is an affordable A3 colour laser printer that is easy to use. This model is upgradeable with added solutions for efficiency and reliability, but it can be expensive. 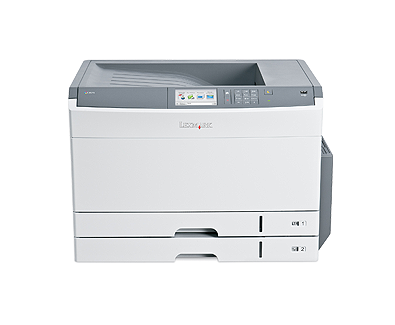 The Lexmark C925de is easy to set up and operate. It measures 16.54 inches tall, 21.93 inches deep, and 24.49 inches wide with the paper cassettes closed, and it weighs 43Kg. Its centrepiece is the colour display with touch capability. The device uses colour LED technology with 1200dpi image quality. The device is powered by an 800MHz processor running on 256MB of memory. Default paper handling is catered by the 150-sheet and 250-sheet input trays and a 50-sheet multipurpose feeder, while the output bin can handle up to 250 sheets at a time. Print speeds are up to 30ppm in monochrome and in monochrome on letter-sized paper. The colour touch screen of the Lexmark C925de simplifies on-board operation. High-quality and vibrant output can be printed with ease on a wide range of media types. The multipurpose feeder can handle three types of different media. There are advanced security options available for the Lexmark C925de to protect data and the network. Connectivity options make it easy to share the device in a small office. The printer supports two-sided and direct-from-USB printing. The memory is expandable to 1280MB. The Lexmark C925de is heavy and boxy, and it may take up more space than it should on a standard office desk. It is expensive, and upgrading it makes it pricier. The hard disk is optional, and there are no finishing options available for the Lexmark C925de.